From the moment you step on our lot until the time you drive away in your next car, your buying experience with Car Nation will be top notch. The effort, thought, and attention to detail that is put into every Car Nation vehicle can not be rivaled. Car Nation means quality. Each and every vehicle goes through an extensive 4 Phase inspection process. 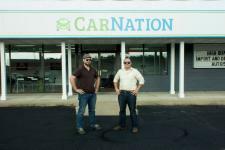 Car Nation stands behind their product with confidence that your experience with us will be fantastic. Call today at 740-450-9666 to schedule your test drive!